Are you jealous of those beautiful bright LED headlights illuminating the road ahead every time a fancy luxury car drives by? Don’t worry, you don’t need to shell out luxury car money to get yourself a pair of luxury car headlights. 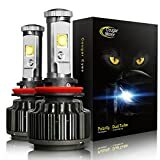 The CougarMotor LED Headlight Bulbs All-in-One Conversion Kit costs just $44 on Amazon, and the kit comes in any size to fit any car. Here’s the best part: even without any experience working on cars, just about anyone can install these new headlights in 30 minutes, tops. If you’re savvy and you’ve fiddled with things before, you can cut that in half and do it in 15 minutes!